The will be no Irish players in the Ricoh Women's British Open at Royal Lytham and St Annes after Rebecca Coakely and Claire Coughlan-Ryan narrowly failed to qualify. The pair shot two-over par 76s in Final Qualifying at Fairhaven GC in Lancashire to finish one stoke outside a 14-strong play-off for the final qualifying spot. The play-off lasted five holes before Swedish amateur Caroline Hedwall, beaten in the British Women's Open amateur championship final at North Berwick last year, won the last of the 20 places available in the championship. 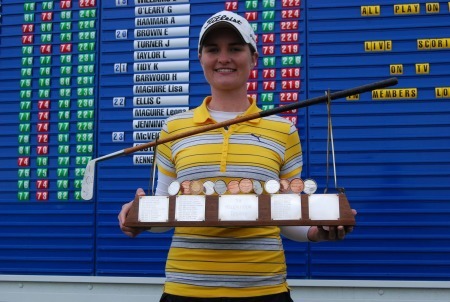 Hazel Kavanagh shot a four over par 78, Royal County Down amateur Danielle McVeigh a 79 and Martin Gillen an 80. America’s Jill McGill carded a fine three under par 71 in blustery conditions to claim top spot.Rookie of the Year on the LPGA Tour in 1996, McGill carded five birdies and two bogeys to finish one shot ahead of South Africa’s Stacy Bregman and compatriot Reilly Rankin and in the process claim the first of 20 places available for the 2009 Ricoh Women’s British Open which starts at Royal Lytham & St Annes on Thursday. Royal Portrush's Stephanie Meadow cruised through Final Qualifying for this week's Ricoh Women's British Open thanks to yet another third place finish. Ireland’s Stephanie Meadow will be bidding to extend her fast start to life in the professional ranks when she tees up in the Ricoh Women’s British Open Final Qualifying at Southport & Ainsdale on Monday July 7. Five Irish pros are now guaranteed starts in this summer's €500,000 AIB Ladies Irish Open. Never mind the professionals, Ireland’s amateur ladies have the game to take on all comers. Just 24 hours before she is named in the Curtis Cup side alongside the brilliant Cavan twins Lisa and Leona Maguire, Danielle McVeigh overcame a bout of suspected food poisoning to win the 54-hole Helen Holm Scottish Women’s Open Amateur Strokeplay Championship at Troon. Korea’s Haeji Kang holds a share of the lead after the first round of the Ricoh Women’s British Open at Royal Liverpool.Leona Maguire made a promising start as Koreans Haeji Kang and So Yeon Ryu set the pace in the Ricoh Women’s British Open at Royal Liverpool.